I'd love your opinions in this little compare and contrast question. Which would you rather have and why? In other ways they are very different (gold vs. steel, modern vs. vintage, manual vs. automatic). (BTW, I'm in suit and tie every day of the week, currently wearing my Reverso 1931 with all). I just made the choice yesterday. I did not have a VC to compare to or other dress watches for that matter. I'm usually a sports watch guy but wanted a dress watch when I wear suits. When I saw and tried it on, I had to have it. As your can see, it works well when walking the dog, too! Easy for me: JLC. 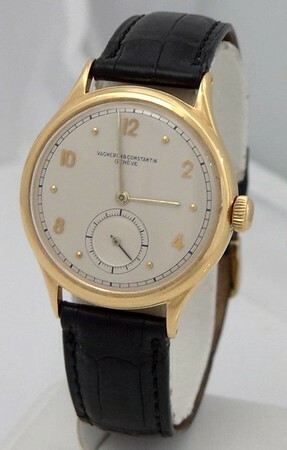 It is such a charming and elegant watch. (With a modern movement.) Have seen one in the wild (40 mm option), across the aisle on a flight - enough time to be seduced, it is an absolutely lovely watch! 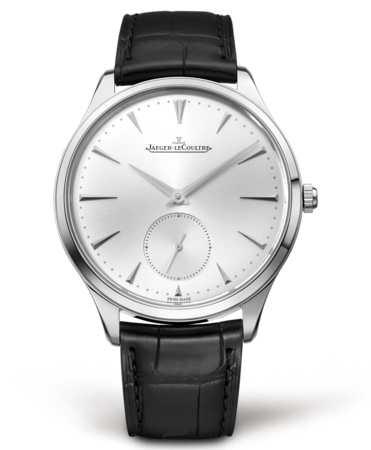 I prefer the JLC. 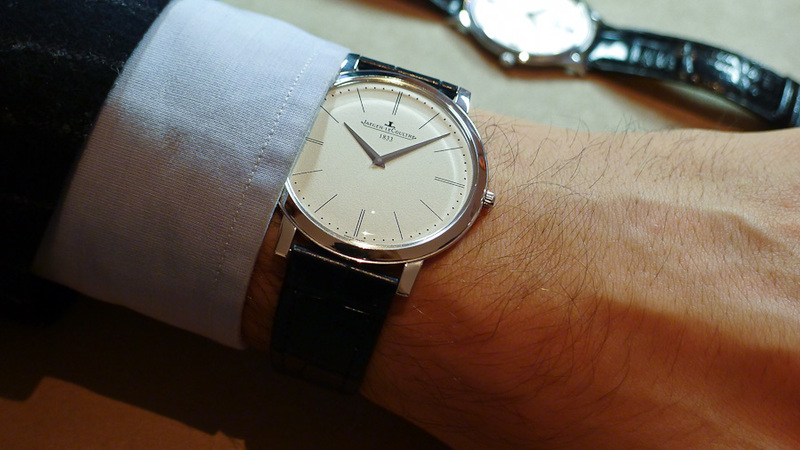 Both have the classic look, but JLC is slightly larger and in steel which appeal to me more. I responded to your post on the VC forum, but Steve raises the interesting choice of the 34mm MUT. Excellent thought, Steve! I MUCH prefer the original MUT and the movement inside it to the larger JLC. Still would choose the V&C, but the race is closer. 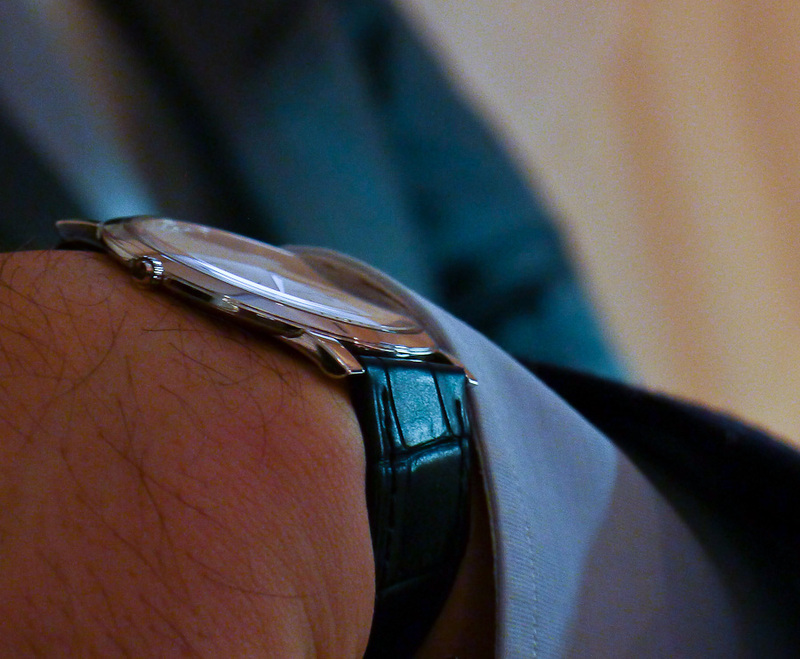 Every man deserves a fine dress watch! Great choice. And if you want something larger, the MUT Jubilee is to die for. 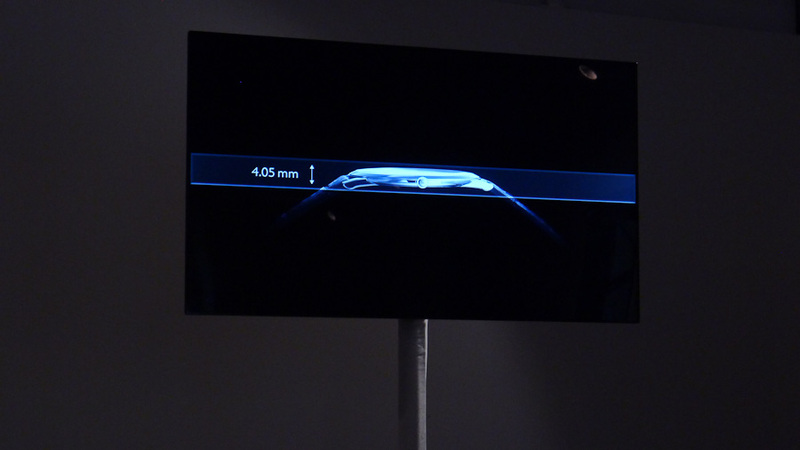 This Ultra Thin is rated to 50mm water resistance, which necessitated the solid caseback, as the parts are so thin. 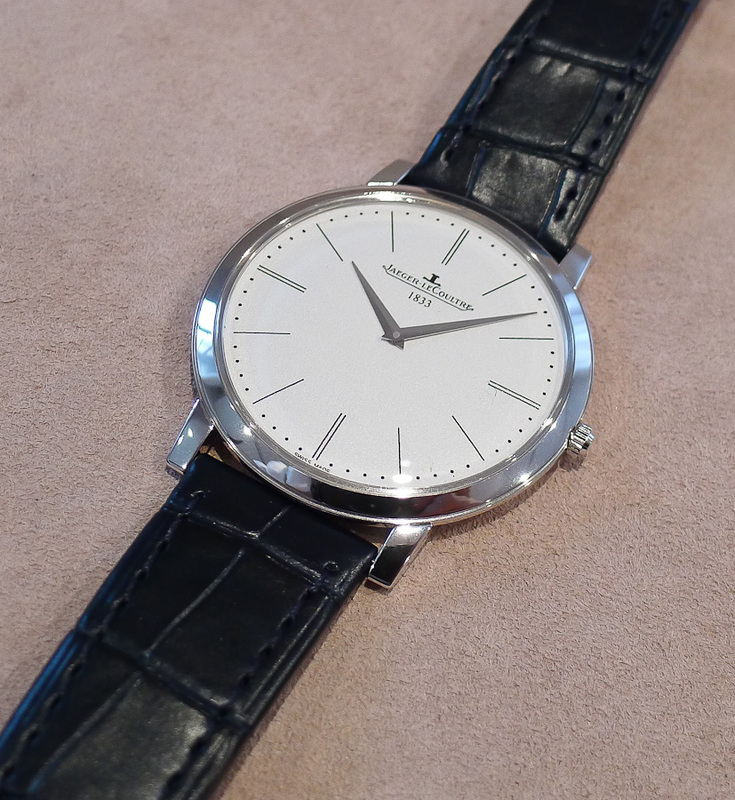 Let me answer the first question: JLC MUT vs VC. 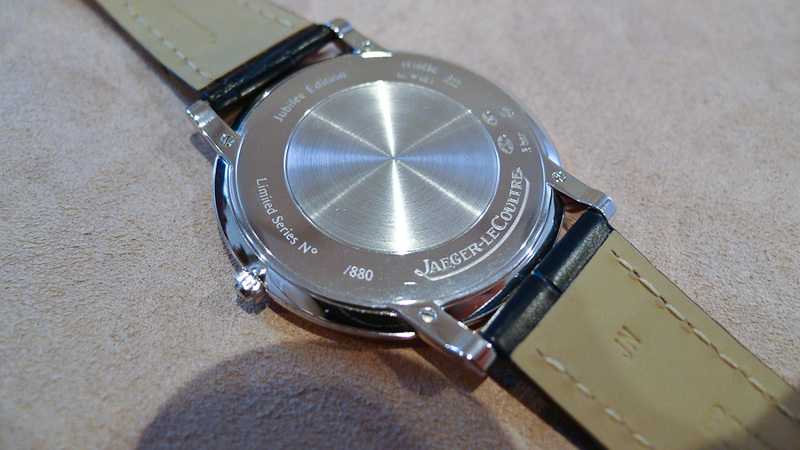 Since I am a big fan and subsequently a proud owner of the JLC MUT moon, my vote would go for the JLC MUT. I believe it shares the same case that I find exquisite in design and the reduced size of the new MUT suits it better than the older 40.5mm. Somehow, the proportions are just right this time. The movement is spot on and very accurate, it is subdued and very classy at the same time. A timeless design without being boring. Easier said than done. The VC has the vintage thing going for it but I find its design, although still on the dressy side, to more casual. As for the original MUT 34,as sleek as the design is, I find it a bit small. On the other hand, funds permitting, if you could put your hands on a jubilee...that's another story!! 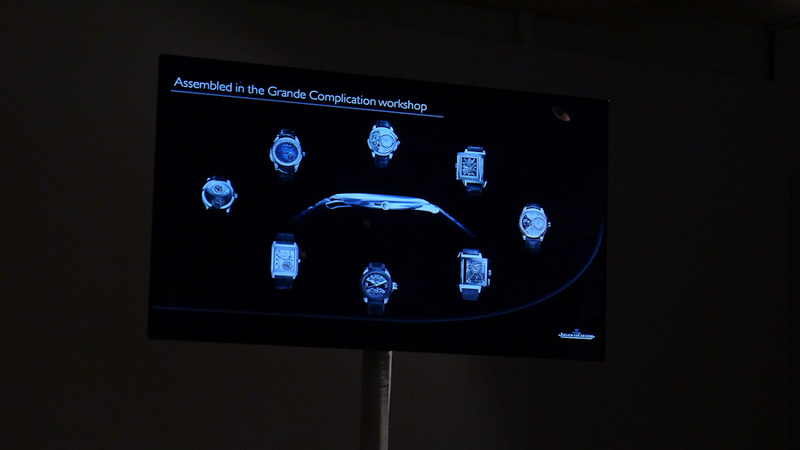 How about a skeletonized version of it, in a watch all of 3.6mm in overall height? That's the thinnest at this point. Thinner still? I'm sure we'll see it eventually. Thanks everyone. I love this forum! And I love these threads where people share their perspectives. I *ALWAYS* learn something. Ok - new question> Why does everyone point to the MUT34 and not the subsequent MUT38 (with the same prized movement). 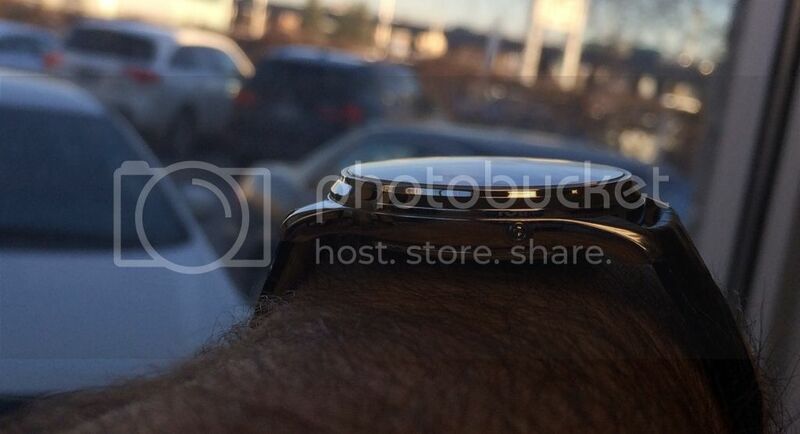 I know several people don't like the "spacer" solution toward a bigger watch . . . but is there another reason that the 38 doesn't get your recommendation? and personally think it's a fine successor to the original MUT. Others really love the 34mm size, and you were looking at a 35mm VC. I think both are great. This is a matter of personal preference, I'm afraid! 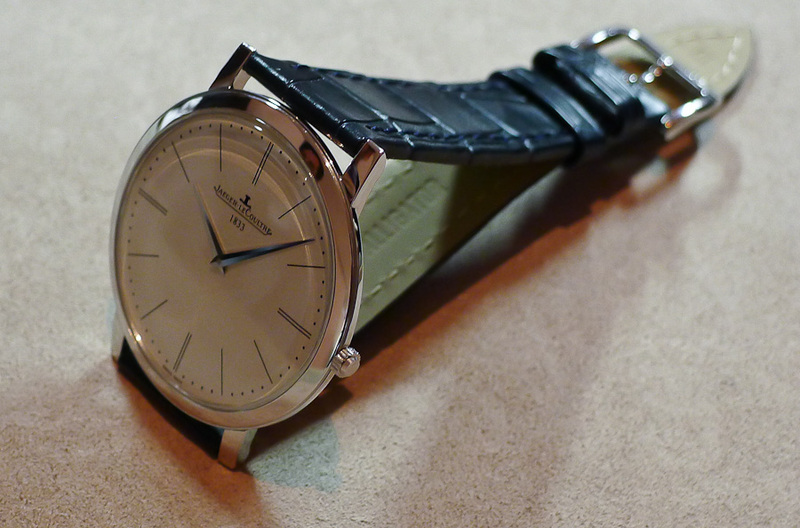 The Vacheron 31.5MM Patrimony Extra-slim had the VC Calibre 1003 which, if I recall correctly, was 'based' on a version of the JLC calibre 849 and was, I believe, 1.67MM thick. I loved that watch!! Should've bought it when I'd tried it on in Paris circa 2005. Then there were the LeCoultre pocket watches. 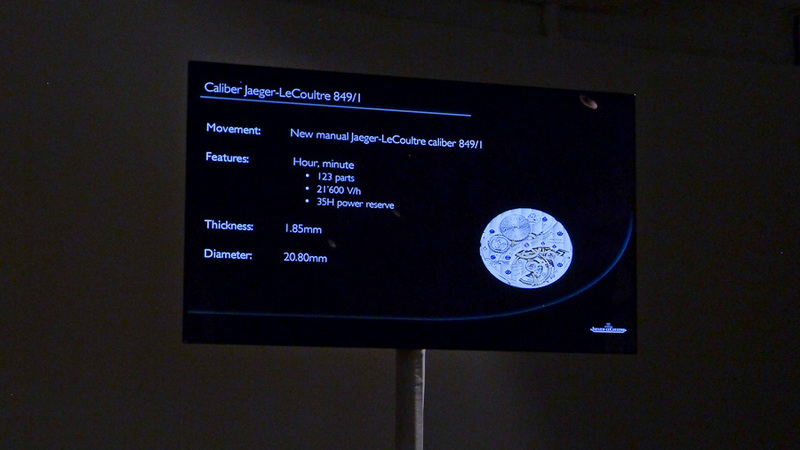 The 1907 Ultra-thin pocket watch with the LeCoultre Calibre 9 JVB, 1.5MM thick. 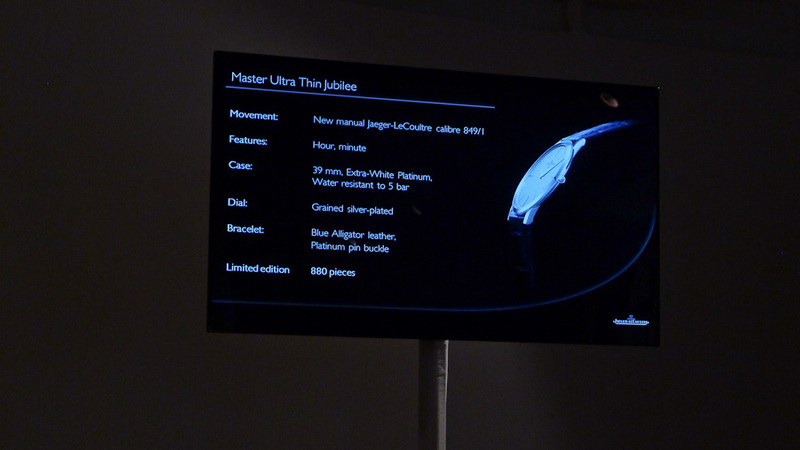 And beyond that the knife watches of the same era equipped with LeCoultre Calibre 145, just 1.38MM thick. Potential inspiration for today's team? Incidentally, those skeletons are, er, drop dead gorgeous! We'll see how far they can stretch it. The helpfulness and enthusiasm on the forum are just remarkable. As for the 34mm vs 38mm, I happen to like both a lot, and the 38mm looks better on my wrist. The 34mm absolutely nailed it with the proportions, case details, and stunning movement. The 38mm is perhaps extraneous for those settled on the 34mm, but fortunately it offers an alternative for those wanting a larger case. Much like the 37mm vs 39mm Reserve de Marche. If you found the original version close to perfect, any other interpretation is just messing with perfection. Thst is my take. Others will hopefully add theirs. For those who can be there, it's sure to be a wonderfully intimate opportunity to chat with the personalities involved.